/ How Do I Set Up My Console For Band Lighting? At this point in the game, we have lights on stage, followspots, haze and are almost ready to go…except for control! By this point in time, we’ve got a really cool rig setup, but it’s not so cool if the only control you have is to turn it all on. That just doesn’t scream “concert”, does it? As you may know, there are many, many different lighting consoles out there. I want to quickly summarize the basic setups for band lighting on each type of console. 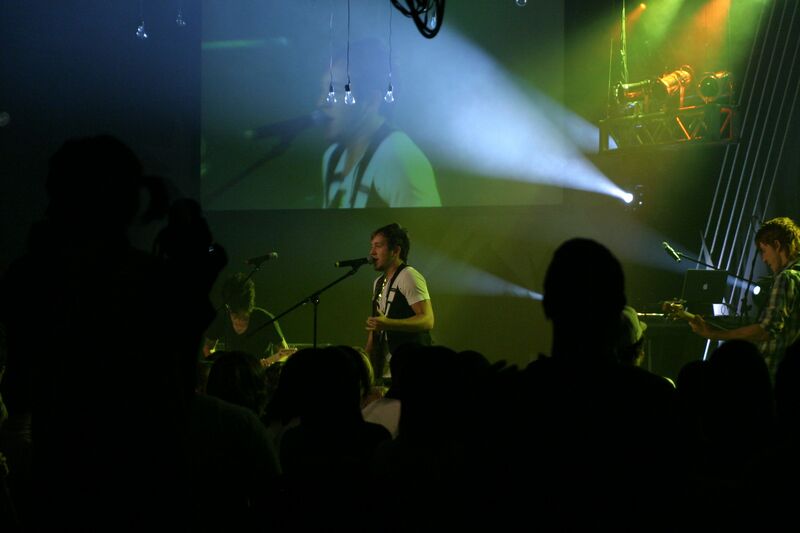 In concert lighting, you want a healthy mixture of flexibility and speed in grabbing faders and bringing up lights. It may seem like a contradiction, but you really need both single lights and big looks programmed. You never know what is going to happen in a live setting, and you sure don’t want to be caught with most of your lights off as the band dives into a big song! Conventional consoles excel in concert lighting with conventional and LED lights. Ideally a conventional console for concert lighting would have a minimum of 24 submasters plus 24 or more single channel faders. Of course, the amount of faders needed is proportional to the amount of lights and groups of lights that you have. You don’t need 24 submasters if you just have a 3 color front wash and nothing else! Need to know what console is best for you? Check out this guide to choosing your first lighting console! I usually set up a conventional console starting with submasters on the left for my houselights, followed by each group on lights by position(colors front/back, etc). I then put my front light specials on individual faders and then move to the right side of the console and build chases and “oh shoot” complete looks that I can go to if I need full stage lighting look in an instant. You’ll notice that I conveniently just told you to put all your important faders right where your hands rest on the console. This is on purpose, and allows you to move quickly in this concert setting. In the middle I use inhibitive submasters for each of my groups of lights, and some sets of “half groups” so I can take out every other light. Inhibitive submasters are like the grand master in that they must be at full for the lights to be on. Bringing the inhibitive master down will bring the light’s intensity down, no matter how it is brought up in the console, but it will not turn on the light itself. Some conventional lighting consoles can’t do inhibitive submasters, and that’s okay too. Just skip that part and use those faders for more looks or individual looks. You’ll still have a great show! I put these faders in the middle because I touch them less than the others, and either of my hands can reach them easily if the other is busy bringing up other lights. Inhibitive submasters bring you incredible flexibility if your console has them, because they allow you to bring up a complete look fader and then remove lights from it and add them back in as needed. Modern moving light consoles offer the ultimate in flexibility because they use LTP as their method of determining precedence. I cover LTP and how it works in this post. Like the conventional console world, more faders the better for concert lighting. Touch screens on many consoles can also be configured to give you more faderless playbacks. If you are coming from the conventional console world, however, you’re going to miss all of the faders you used to have, unless you are on a Avolites Pearl console. On a moving light console, I typically set up my show in a similar way to the conventional console, starting with my main groups of lights on the left. I will stack some chases on top of these groups so that I can just hit the play button and get a new look right there. Depending on your show you may be able to stack a lot of looks- it all depends on what you can keep track of! On the right side of the console, I’ll build some looks and positions for moving lights. You really only need 1 fader for complete looks, so you can save more for positions and color combinations for your ML’s. You can then break up the moving lights into 2 groups and build separate position faders for each group, allowing you to bring up a positions on all your ML’s, then grab one group mid-way through a song and move it somewhere else. This instantly gives you to flexibility of having infinitely more looks without all the programming and number punching to bring up all of your looks. After this point, each moving light console has it’s own strengths and weaknesses which steer the direction of your programming. You may want to build effects on fader-less playbacks or setup more and more intensity playbacks. I challenge you to start here, and to continue moving on as you gain insight by working with your specific lighting system. The last type of lighting console is the PC-based console. These consoles look like either conventional or ML controllers, but have few or no faders. This means you will be limited in what you can program, and should probably stick to only complete looks. If you have a wing, you may be able to do more looks like the consoles above. Use your best judgement in determining how much you can program and physically move around with your mouse. If you console allows both faders and fader-less, button playbacks, you’ll want to use mostly fader-less playbacks to conserve valuable screen real-estate. You really want to stick to one “page” of looks, as scrolling up and down while trying to fire looks may be impossible during a show! Trying to get too complex will probably leave you missing timing cues from the band, and isn’t usually worth its while. So many of these tips are very far above my head because I’m just starting to get into lighting. It does make me excited to see what is in store in the future. I really connected with the suggestion to have the controls close to where you put your hands. I imagine this could work like a keyboard, where you know what each button does and when to use it.